2016 is upon us already. As the euphoria of the new year countdowns die down, and the last strains of Auld Lang Syne fade from our minds, we get back to the grind and prepare for new challenges and look forward to opportunities in our work and family life. 2016 is a leap year, a special year that comes once in every four years. The leap year is usually associated with 29 days in February, and the year in which the Olympic games are held. This year, the Summer Olympics XXXI will be held in Rio de Janeiro in Brazil. On the global economic front, the outlook is generally bleak, with predictions of slow economic growth in many countries. In particular, the growth of Asian powerhouse, China, is likely to be severely dampened and the resultant effect is expected to impact many other Asian economies. Already, on the first trading day of the year, the Chinese stock exchange lost 7% of its value, triggering a "circuit breaker" in the system and halted trading for the day. Although trading resumed after intervention by the Peoples' Bank of China, the global stock markets will likely be unpredictable for the foreseeable future. On our little red dot, life goes on. Following a successful (for the ruling party) General Elections, we see a new bunch of goodies for the citizens (e.g. the Skills Future Study awards), and more programmes to improve the lives of various stakeholder groups. A year after our city-state's 50th birthday, Singaporeans are looking ahead and planning for "what next?". SG50 + 1, as a Minister refers to 2016, starts a whole new anticipation about where Singapore should head. I recently participated at the dialogue of a multi-agency symposium to talk about a "cleaner, greener and smarter Singapore". This SGconversations series will focus on topics related to A City in a Garden, Vibrant Community Spaces, Eco Smart Towns and a Green and Conserving Culture. Urban greenery should embody biodiversity as well. Lush plants and landscaped parks and gardens are not just for humans, but for our birds, butterflies, dragonflies, spiders, and a whole bunch of fauna that call Singapore home as well. 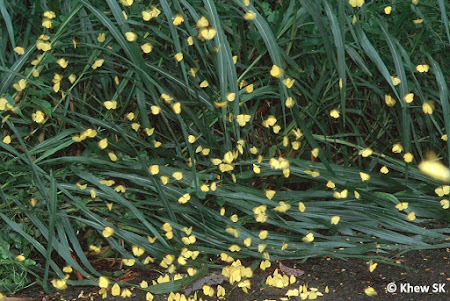 Can developments and improvements for our city life co-exist harmoniously with biodiversity? Do share your ideas at the various symposium sessions or on the e-portals that collect feedback. 2016, where new year resolutions are made. 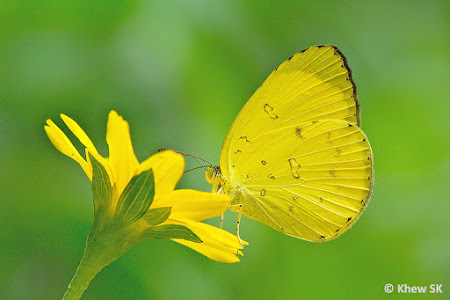 What would be ours for the butterflies? For ButterflyCircle members, our next book project will commence in earnest this year. 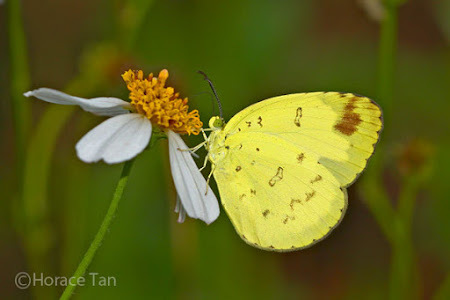 There will be urban and nature reserve surveys and a lot of work to be done on researching host plants, habitats and conservation strategies for butterflies in Singapore. There have been more requests to set up community butterfly gardens and other similar butterfly-conservation initiatives. What have we learnt from the existing efforts that we can share with these newbies? We continue into our 9th year with our Butterfly of the Month series. Let's start 2016 with a bright cheery yellow butterfly to symbolise hope and optimism. Our feature butterfly this month is the common and ubiquitous Three Spot Grass Yellow (Eurema blanda snelleni). 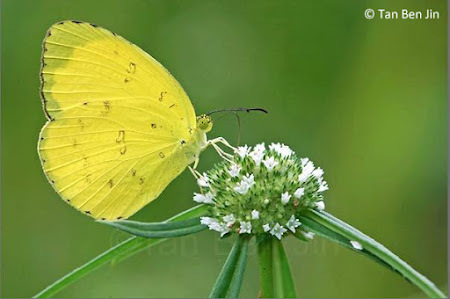 A small but easily encountered butterfly, the species can sometimes be even abundant at certain times of the year. 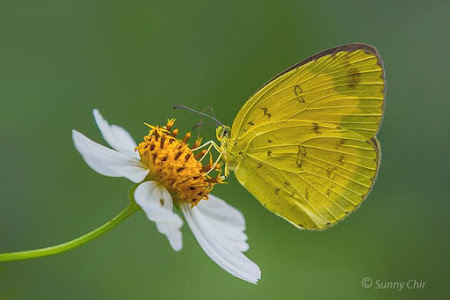 The Three Spot Grass Yellow is one of several lookalikes of the genus Eurema or commonly referred to as the Grass Yellows. The Three Spot Grass Yellow is unique in that it is the only species in the genus to feature three cell spots on the underside of the forewing. Males tend to have reduced upperside black marginal borders compared to the other related species in the genus. The females bear the typically broader and diffused borders. 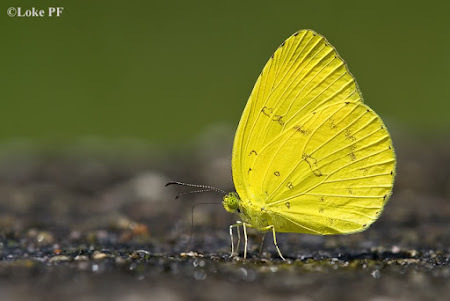 The apical streak on the underside of the forewing appears to be a feature that is mainly associated with females of this species. 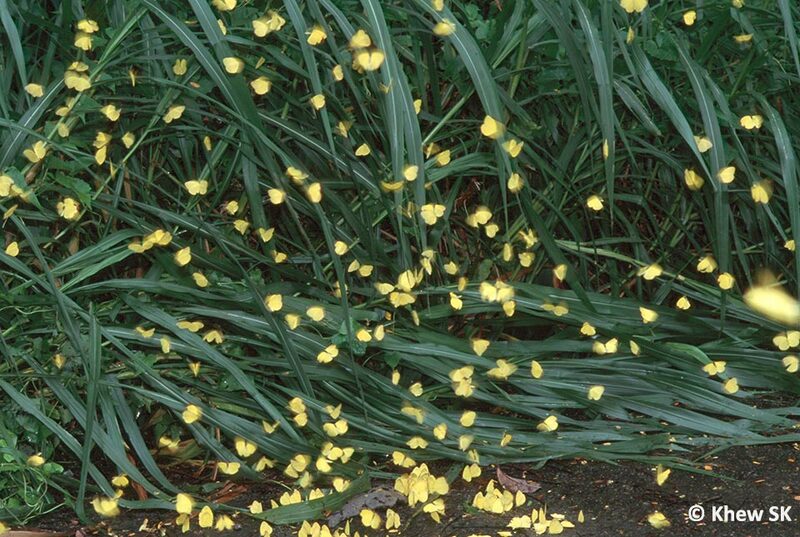 The species can be found in urban locations as well as in the nature reserves. 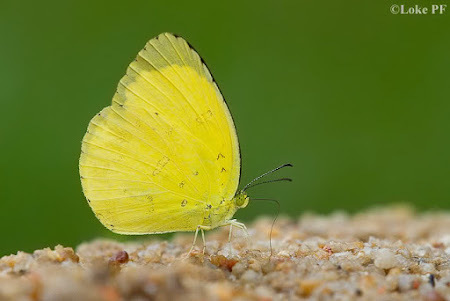 The Three Spot Grass Yellow is often seen feeding at flowering plants but is also observed to puddle in numbers along forest trails and sandy banks of streams which have been contaminated by decomposing organic material. Males appear to be commoner of the two sexes and is sometimes seen with other butterfly species when they are puddling. 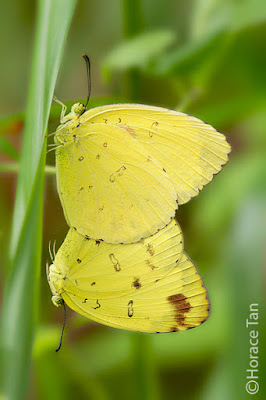 Top : An outbreak of Three Spot Grass Yellows in Singapore's nature reserves. Bottom : How many eggs can you count on this leaf? 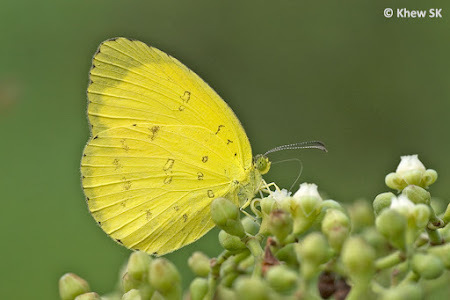 Females of the Three Spot Grass Yellow have been observed to lay large clutches of eggs on the host plant Falcateria moluccana (Albizia), a fairly common tree that grows easily. 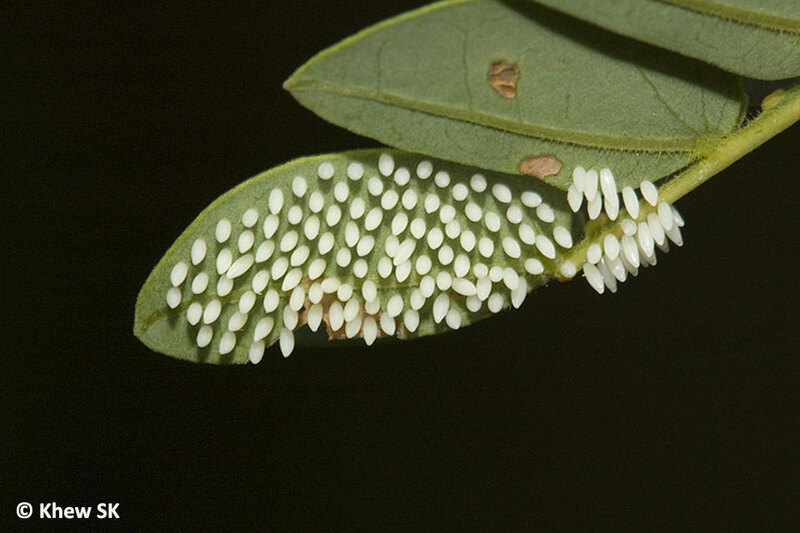 In a single sitting, a female was observed to have laid at least 103 eggs on a single leaf of the host plant! 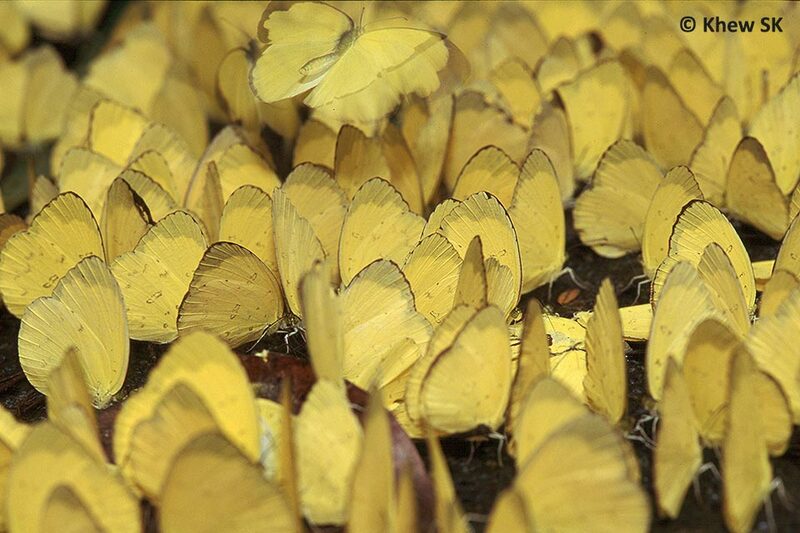 This may explain the occasional outbreaks of this species, as "clouds of yellow butterflies" appear in parts of Singapore. 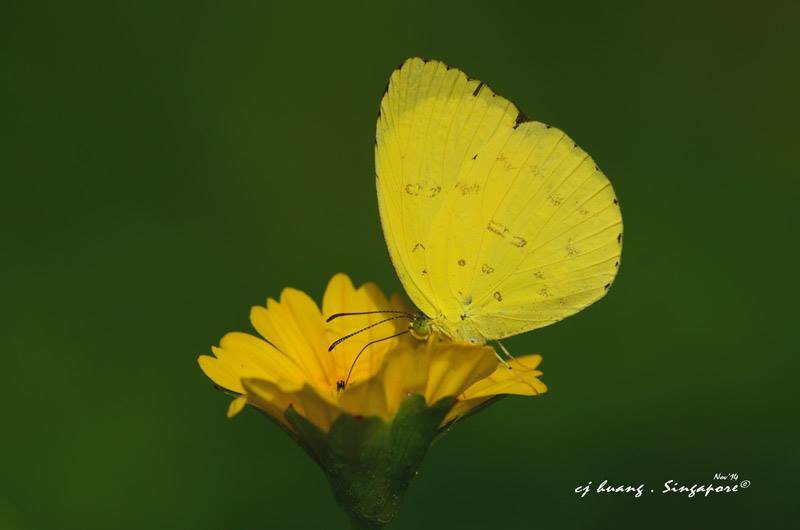 And so we look ahead to 2016 with a bit more optimism and cheer with our bright yellow Three Spot Grass Yellow and hope that this year will be a better year for all!